Most organizations would do anything for that extra ounce of customer feedback. The added insights that sharpen competitive advantage and ensure they remain as relevant as possible in a changing world. The good news is that there are many ways of getting hold of customer feedback. And you can use it to improve your products, tune-up customer service operations, boost marketing and train staff. But how many businesses use more than one or two customer feedback techniques? We’ve compiled a list of 41 customer feedback examples to boost your options and help you hear the voice of the customer loud and clear. 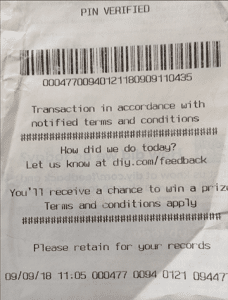 Consumers accept and hold on to in-store receipts, which makes them a popular vehicle for soliciting feedback. Organizations are legally obliged to provide receipts to customers, so it makes sense to leverage that ‘real estate’ to ask “how did we do today?” Receipts are a great customer feedback tool for getting insights directly relevant to the purchasing experience. 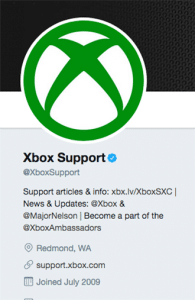 Organizations like Microsoft Xbox often keep their customer support Twitter handle separate from the main corporate account to act as a lightning rod for feedback, queries and problems. Makeup brand Glossier puts customers center stage, using its social accounts to drive a community of interest around its products. 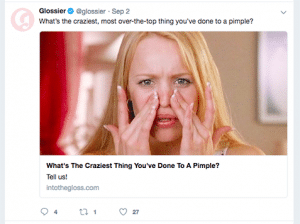 By asking all kinds of customer feedback questions and for ideas, Glossier stimulates lots of user-generated content that can be reposted and repurposed across marketing channels. Hashtag campaigns like #shareacoke are a popular way to get customers engaged, but don’t always elicit feedback you can apply into your business. 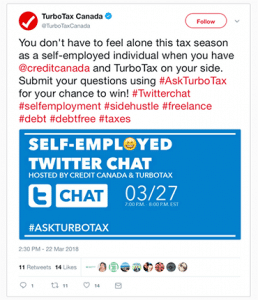 A smarter hashtag approach for customer and client feedback is the Twitter Chat, where customers are invited to attend a virtual gathering to express their opinions and ask questions on a given topic. These generate valuable insight quickly and cost-effectively. The polling capability of social platforms like Twitter and Facebook has been maturing fast. There’s even an established ecosystem of complementary applications out there to help collate and visualise data. And while many of the questions asked are seemingly superficial and ‘just for fun’, smart operators are finding ways of discovering how their products are used and ranked. One of the oldest examples of customer feedback, the focus group is also one of the most expensive and prolonged. The idea is to pick a representative sample of customers, get them in a room, and take them through feedback survey questions and exercises that uncover preferences and experiences. The results are more qualitative than quantitative. There is undoubtedly much to learn from such sessions, but the small sample sizes can lead to selective bias and other issues. Organizations like to have real relationships with customers, and use them to encourage regular feedback – good and bad. But letting an independent body conduct customer feedback surveys on your behalf is also a legitimate tactic. Though less personal, it’s one that can provoke more honesty as respondents say things they wouldn’t necessarily tell you. Depending on your sector and business, pollsters can put questions to thousands of customers and prospects, and guarantee a minimum response. But it typically comes with a very big price tag. You build help pages on your site to give customers information they need. So it makes sense to run a banner or other page insert that asks something like: “Did this page answer your question?” Tech firms and service providers tend to do this best – mostly in relation to their online knowledge bases. But there’s nothing stopping any business using this tactic on any webpage. Some customer feedback can be elicited without asking for it, such as in the public social media chatter exchanged between customers and their networks. 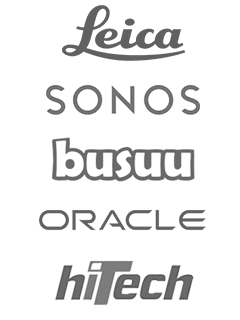 Using tools like Hootsuite lets you track individual mentions that you can manually categorise and learn from. 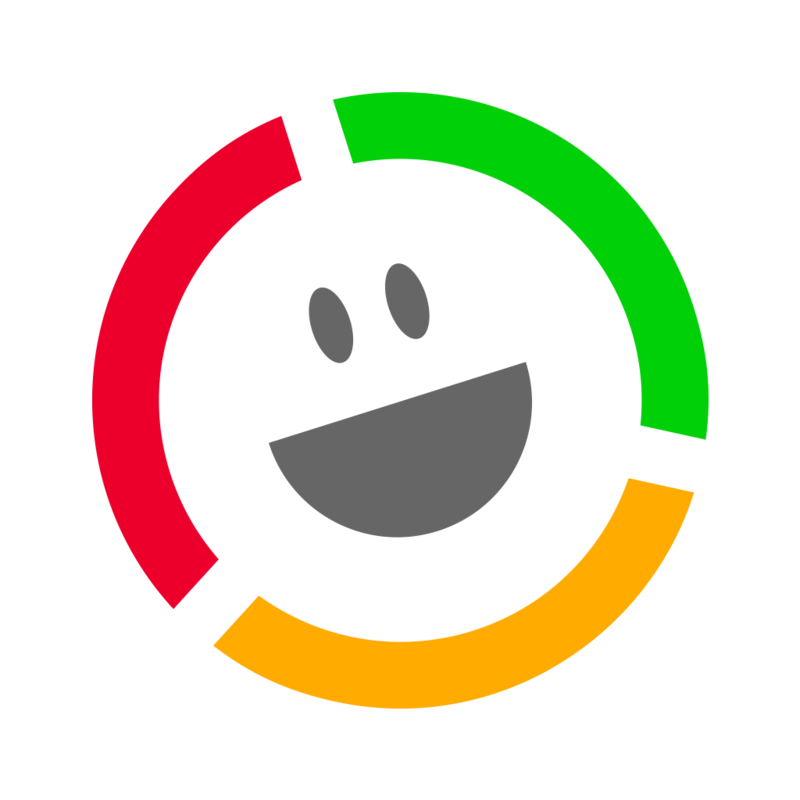 Platforms like Blurrt use algorithms to automate tracking of overall sentiment so that you can see how positive/negative your brand is being communicated. The cost of shipping goods to customers is usually determined by size and weight, so there’s practically no investment required to drop a feedback request form inside the packaging. The key here is relevance to the customer experience. Use the opportunity to get feedback on the quality and speed of the shipping, or the product that was shipped, rather than a generic question about customer satisfaction. 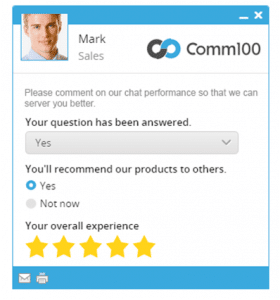 The rising popularity of live chat has made this an effective channel for customer feedback. Chat sessions are invariably initiated by the customer, so will often be event-driven. Don’t make the mistake of looking at chat purely as a sales tool. Or deflecting customer problems without interpreting the underlying trend. Most webchat sessions end by asking the customer about their feedback on the chat session, but you can also use the opportunity to ask about their broader experience. Trucks act as huge advertisements, meaning bad truck drivers can destroy your brand and run up big legal costs. Asking ‘How’s My Driving?’ with a 1-800 number to collect customer feedback is like an insurance policy against these risks. And it’s paying off for more and more organizations. In this approach, organizations can ask single or multiple customer experience feedback questions, directly after the transaction. It’s typically used as a means of scoring the performance of contact center agents, but could be employed more broadly too. 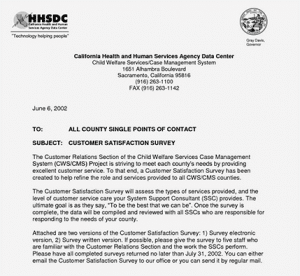 Many organizations like to cover the bases by having a feedback form on their website. It won’t win any prizes for subtlety – and may gain little use – but it shows customers that you’re listening. It also lets them articulate their opinion, on their terms, at a time that suits them. Phoning up your customers out of the blue to get their feedback can make a change from trying to renew commitments or upsell new products. This is a tried and trusted method, but one that is losing popularity as customers can find it invasive to their lives and irrelevant to engagement context. B2B organizations will often make appointments to visit customers. It’s a cool way to gather client feedback outside of the transactional requirements of the relationship. Over lunch, at the customer’s office or even in the customer’s home – wherever is the best environment to encourage the customer to open up. Organisations can bolster their image by launching an activism campaign that champions corporate ethics and reflects positively on the brand. 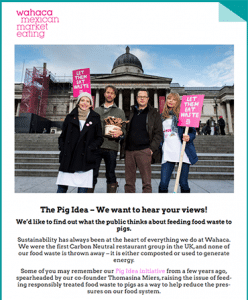 Customer feedback is key to supporting the right cause and understanding how to evolve the campaign so that customers are involved, not alienated. Who does this anymore? Before email, customer feedback questionnaires were posted out in the regular mail to each customer address. Later, organizations used fax machines for the same purposes. Nowadays, such tactics are rare and – with people living such busy lives – it’s hard to see it making a comeback. 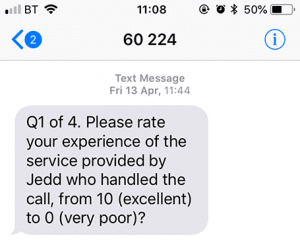 Another great example of how customer feedback opportunities are shrinking to fit inside every aspect of the customer journey. 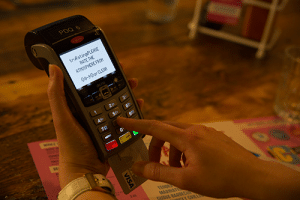 With some clever programming, payment card terminals are transforming into polling machines. As well as securely collecting your card details, some now capture your response to key questions. Online forums, review sites and blogs are valuable sources of customer feedback about your organization. And you may never see it unless you go searching with tools like Google Alerts. Expect everything from nasty complaints and positive endorsements. Even detailed, technical explanations about your products and services work that have been left for others to learn from. So you’ve bought your items from an e-commerce store and you’re waiting to see the confirmation appear… When it does, you’ll see that most online traders now offer the facility for customers to give instant feedback on their shopping experience. Industry trade shows and other public events are worthwhile opportunities to collate valuable customer feedback. Simply arm some colleagues with a tablet, a smile and lots of candy to thank customers for their time. Within a few hours you could have lots of useful insights to influence how you do business. Letting customers leave comments on your blog posts and latest news pages is a good way to gather feedback about defined topics. And as an open forum, you can even guide and moderate discussion between customers in your community. 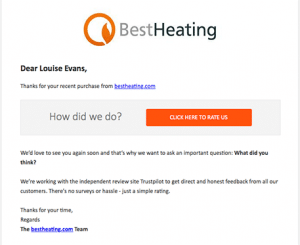 One of the best times to get customer feedback is straight after you’ve solved a problem for them. 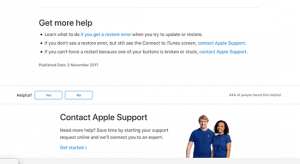 Customer support departments using service desk software will raise a ‘ticket’ for each case, and only close that ticket once the issue is resolved. Hence it makes sense to request feedback in the ticket closure confirmation email. Valuable customer feedback should be constructive, relevant and timely. Get all three by giving customers the facility to review a product they’ve recently bought. Organizations might be fearful that this will open the floodgates for negative reaction, but this rarely happens. In any case, you will have received useful feedback to inform future product development. 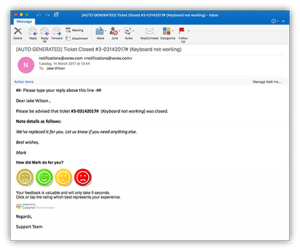 Instead of hiding behind a contact form or generic email address, some businesses give transparent access to named individuals so that customers can ask questions or leave feedback. These work best on product pages so that the customer engagement is as relevant as possible, and feedback is fed straight into improvements. It’s hard to put a cash value on customer feedback, but every piece is certainly worth paying for. Some organizations take this literally by offering up iTunes or Amazon vouchers for every piece of feedback, or else a grand prize awarded at random to one person. Much of today’s customer feedback science is about ‘conversational’ interaction and giving feedback opportunities at every point of the customer journey. That doesn’t stop some firms from wanting to benchmark customer sentiment and opinions at set milestone dates. You learn a lot from customers when you give them a multiple choice question and the opportunity to vote blind and anonymously. The classic example is grocery stores letting customers decide which local charity to fundraise for. 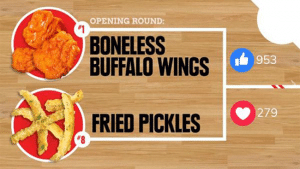 Here, they are used to judge the best food stall at a BBQ cookout competition. 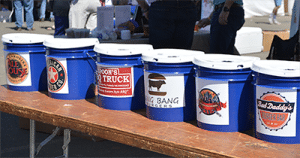 For this simple customer feedback tool all you need are half a dozen buckets and enough tokens to let each customer vote once. 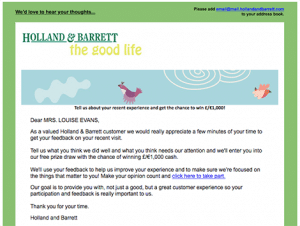 It’s vital to get feedback on the so-called ‘customer experience’. But what if you are in the business of selling experiences? If so, you need to get feedback to keep that experience fresh and relevant for future customers. 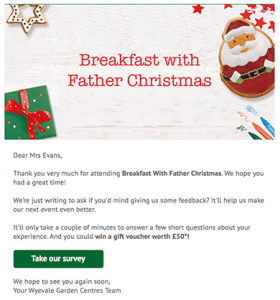 That’s especially if it only comes around once a year, like this example of a Father Christmas (Santa Claus) kids event. A marketplace like Amazon doesn’t just trade on its own products, but by facilitating third parties to offer an even wider range. 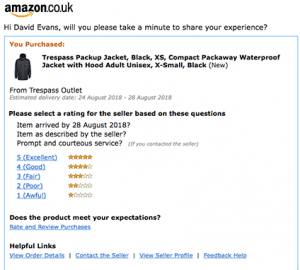 As such, getting customer feedback about the behavior of these sellers doesn’t just inform buyers’ choices, but also helps Amazon ensure high standards. Wanna know why visitors are leaving your site? 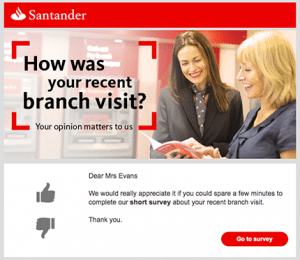 Using an exit popup window allows you to ask that question, and learn from the customer feedback. Organizations use this to devastating effect to improve their web visitor metrics and optimize content. Customer loyalty can pivot on the decision to renew contracts. Getting feedback around that decision can have a huge bearing on every aspect of managing customer relationships. Some organizations use it to find out how they are performing across a range of metrics. 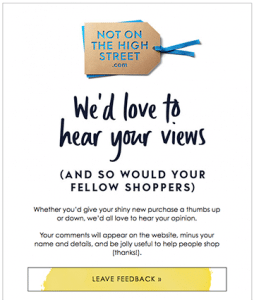 Email notifications are frequently used to confirm online purchases within seconds of customers clicking ‘buy’ via a website or app. This is the ideal opportunity to ask for up-to-date customer feedback about everything to do with the transaction process. Asking for customer feedback is all about the timing, but not every request goes out immediately. 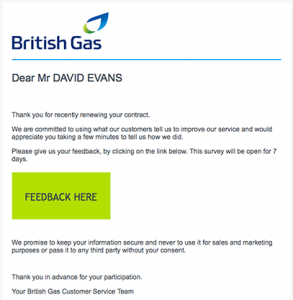 Many businesses will wait 24/48 hours before emailing customers for their feedback following a visit to a branch or store. That way the customer doesn’t feel ‘stalked’, and feedback takes the form of settled opinions rather than instant gut-feel reaction. Video case studies can be expensive and time consuming to produce. If they look too polished then the customer feedback within them lacks authenticity. This novel approach is designed to encourage video-based customer feedback by making it extremely simple. 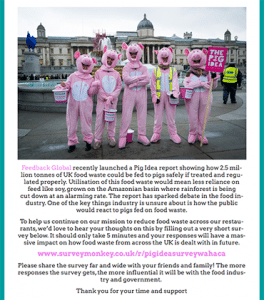 No makeup, no cheesy music – just short, honest responses that inform the organization and contribute to marketing efforts. 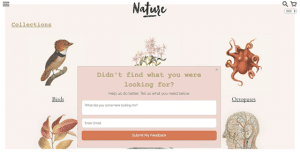 Use customer feedback to inspire and educate other customers through an online community. The trick here is to ensure the community is actively moderated in order to shut down any misuse. By listening to the feedback, organizations can pick up new product ideas they otherwise could not have imagined. With many organizations using apps to engage with and serve customers, it makes perfect sense to use this channel as a highly effective customer feedback tool. 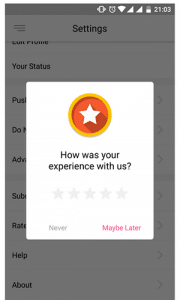 It only works if the questions don’t disrupt the app experience. Organizations have been working hard to understand customer feedback based on the smallest indicators. 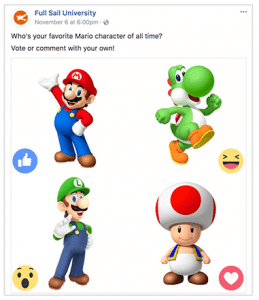 Facebook Reactions goes beyond ‘Likes’ to offer a broad spectrum of emojis that customers can use to respond to posts. The effect is that brands are increasingly using these as proxies for real emotions, giving a deeper insight into what customers think. Didn’t your parents ever teach you to be quiet during a movie? Well, YouTube Cards let publishers politely interrupt their clips to gain valuable customer insight from viewers. This is great for in-the-moment customer responses, even if it does mean breaking their concentration a little. 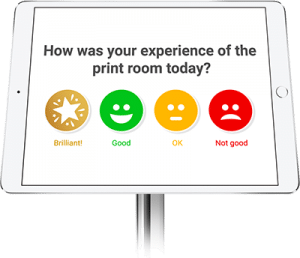 The simplest form of customer feedback is to touch a panel of four faces to show which matches your satisfaction level. These customer feedback systems are proving increasingly popular to gather input on communal facilities. Like in airports where passengers have just passed through security. Using a simple tablet screen platform makes it easy to set-up and apply to different scenarios. Want to get more customer feedback into your organization?